Martha Coakley, Donald Berwick, and Steve Grossman met in a debate Wednesday. Wednesday night, Don Berwick was a man with nothing to lose. Trailing in the polls and with little time before Tuesday’s Democratic gubernatorial primary, the former Medicare and Medicaid chief sharply criticized opponents Martha Coakley and Steve Grossman as stale agents of the status quo. The attack came at a high-stakes televised debate before potentially one of the largest audiences of the race. Coakley, the attorney general, and Grossman, the treasurer, calmly parried the attacks. Coakley portrayed herself as a defender of working people who will seek economic opportunity for residents from all walks of life. Grossman pitched himself as an experienced job creator who can help the state’s economy blossom. Topics at the debate ranged from the candidates’ age (all are in their 60s but insisted they connect with younger generations) to money in politics (all aspire to reduce its influence) to the death penalty for accused Boston Marathon bomber Dzhokhar Tsarnaev (all oppose it) to lighter fare. Only Coakley could name the Patriots’ new backup quarterback, Jimmy Garoppolo. Recent polling has found Coakley leading her rivals by wide margins among likely Democratic voters. In four recent surveys, Coakley led Grossman by margins ranging from 12 percentage points to 32 percentage points, with Berwick trailing both in every poll. In one survey, Coakley led Berwick by 43 percentage points. 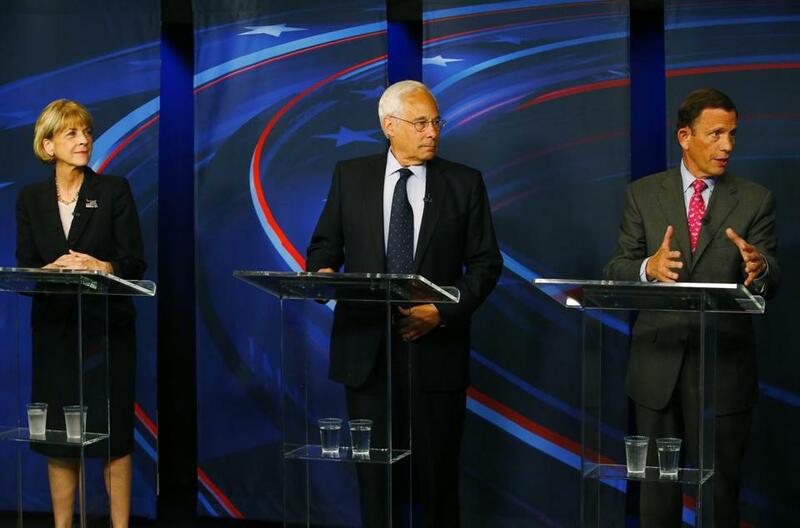 Throughout the debate, each of Coakley’s two opponents — Berwick, sharply; Grossman, politely — made the case for why voters should choose him over her. Berwick, a former top Obama administration official who oversaw the country’s massive Medicare and Medicaid programs, touted his leadership chops and opposition to casino gambling in the state. He took repeated aim at Coakley over the course of the hourlong debate, aired live on WCVB-TV (Channel 5) and WHDH-TV (Channel 7). He recalled her 2010 US Senate loss to Republican Scott Brown and insinuated that, should she be the Democratic nominee, she could well lose again. Coakley said she was putting together a more robust get-out-the-vote effort than she had time to do during the short runup to the 2010 special election, but she focused her response on what she has done as attorney general and what she would do as governor. She cited her work fighting Wall Street to help people avoid foreclosure and stay in their homes and her office’s battle against the Defense of Marriage Act, part of which was subsequently declared unconstitutional by the US Supreme Court in a ruling celebrated by gay rights advocates. Coakley said she had an economic plan that would move Massachusetts forward. Grossman’s most forceful attack — although still relatively restrained and polite — came during a discussion of a Coakley economic plan focused on boosting growth across the state, including regions outside the booming Boston metro area. He asked her to name three new specific examples of capital or infrastructure projects. Throughout the debate, Grossman, a longtime owner of his family’s printing and marketing business, emphasized his job creation credentials in the private sector and as a statewide officeholder. He mentioned a treasury program that took some of the state’s reserve deposits that were in foreign banks, brought them to Massachusetts banks, and encouraged them to be loaned to local small businesses. Grossman and Berwick also criticized Coakley for giving the green light to Partners HealthCare System, the state’s largest network of hospitals and doctors, to acquire South Shore Hospital and Hallmark Health System. Both Berwick and Grossman said the agreement, which still needs a judge’s approval, would raise costs. Coakley, again remaining cool, said she stood by the deal and argued it would level the playing field for competition and help reduce costs. Coakley’s settlement with a lobbying firm led by a former state legislator was an early point of contention. The firm, accused of collecting hundreds of thousands of dollars in improper fees from a hospital, did not admit any guilt but agreed to repay $100,000. Grossman said that the settlement showed “bad judgment” and that it represented “the worst of what Beacon Hill is all about.” The attorney general stood by the agreement, implying it was the best settlement possible. Wednesday’s debate was held in Boston at the studios of WHDH-TV. The other members of the sponsoring consortium were WCVB-TV, WBUR, and Bloomberg Radio. All three Democrats will have time to make another live TV pitch to voters: They are scheduled to meet again on Thursday from 6 to 7 p.m. on New England Cable News. The winner of the Sept. 9 Democratic primary will face four other candidates in the Nov. 4 general election: either Republican Charlie Baker or Mark Fisher, and three independent candidates, former businessman Evan Falchuk, venture capital investor Jeff McCormick, and Christian pastor Scott Lively.